Created a corporation in 2000 chartered by the TO actively seeking land in the Phoenix Metro area for the “possibility of doing a casino” prior to the 2002 statewide vote on the Gaming Compact. Looked it sister Tribal leaders in the face and lied to them. Actively promoted and financially contributed to the campaign in support of Proposition 202, the Tribal Gaming Compact, promising voters that there would be no new casinos in the Phoenix Metro area. Actively participated in the election campaigns of sitting councilmembers who voted for these agenda items through the TO’s independent expenditures for campaign mailers in support of these council persons. Expect them to do the same in this election cycle. These four elected officials owe the TO and they know it. These majority council votes by Alvarez, Sherwood, Hugh and Chavira stink to high heaven. 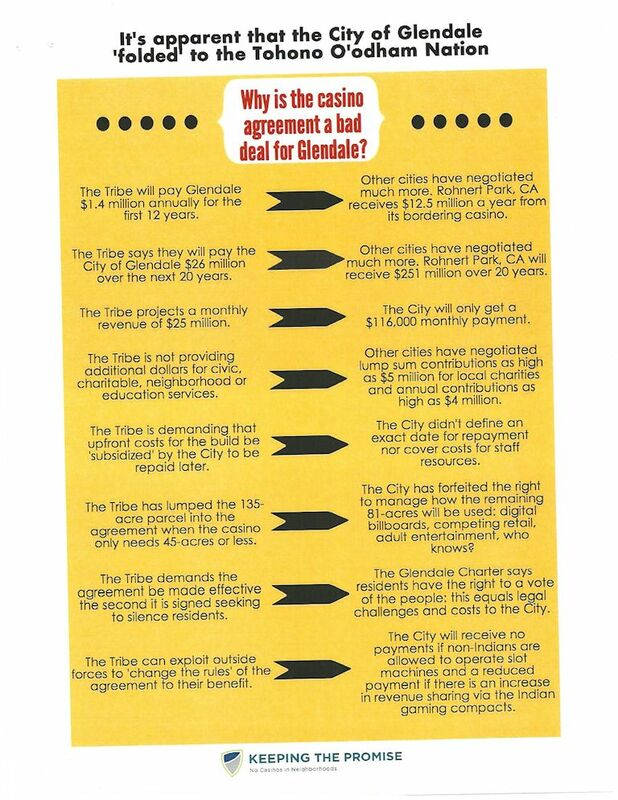 Were these four elected officials acting in the best interests of Glendale? You can decide for yourselves but I think not. If and when these council votes come before you, the voter, you will have an opportunity to reject these council votes and send a strong message to these councilmembers that “back door” deals will not be tolerated. There are still actions that have not been settled…legal decisions not yet rendered and legislation introduced by Senators McCain and Flake awaiting a full Senate vote up or down. The Tohono O’odham are making a million dollar bet that nothing will stop them. They could end up losing that bet. Remember, it’s not over until the fat lady sings and she hasn’t sung…yet. © Joyce Clark, 2014 FAIR USE NOTICE This site contains copyrighted material the use of which is in accordance with Title 17 U.S. C., Section 107. The material on this site is distributed without profit to those who have not always been specifically authorized by the copyright owner. We are making such material available in our efforts to advance understanding of environmental, political, human rights, economic, democratic, scientific and social justice issues, etc. We believe this constitutes a ‘fair use’ of any such copyrighted material as provided for in Section 107 of the US Copyright Law and who have expressed a prior interest in receiving the included information for research and educational purposes. For more information go to http://www.law.cornell.edu/uscode/17/107.shtml. If you wish to use copyrighted material from this site for purposes of your own that go beyond ‘fair use,’ you must obtain permission from the copyright owner.